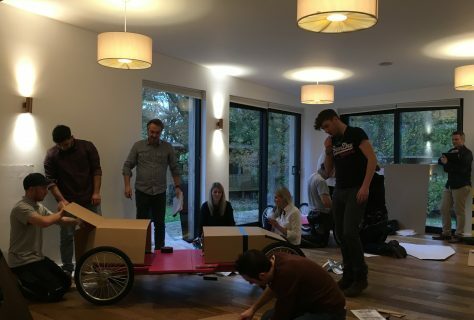 The D4R took part in a spot of team building yesterday! 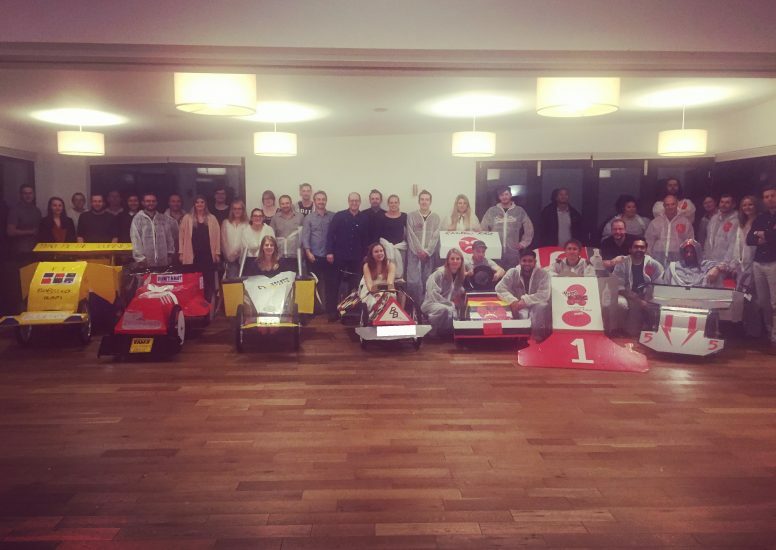 It’s a rare occasion for the whole team to be in one (pretty big) room, but it’s safe to say that everyone enjoyed their afternoon together. When the team-building task was presented to us, pretty much everyone’s face was a picture of confusion! 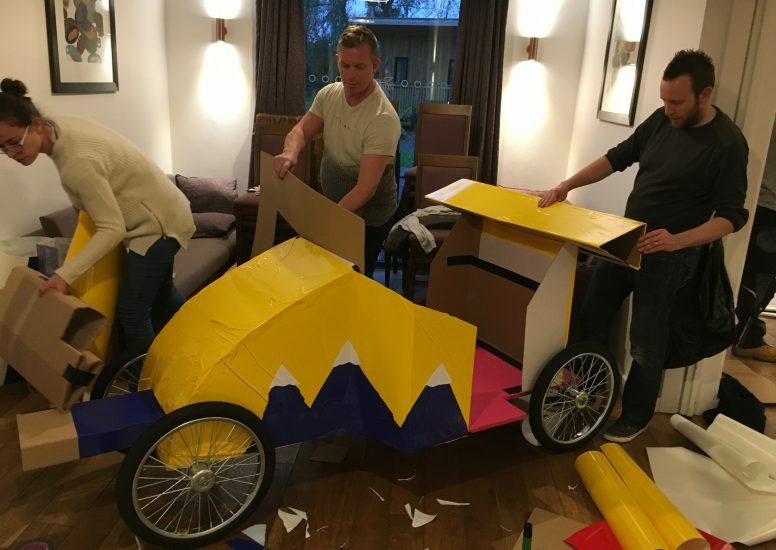 Make a Formula 1 racing car out of cardboard which someone would sit in. You might be asking yourselves the same question we did: how on earth does cardboard hold the weight of a fully-grown adult? Even explaining that we had wheels to use didn’t help our confusion! 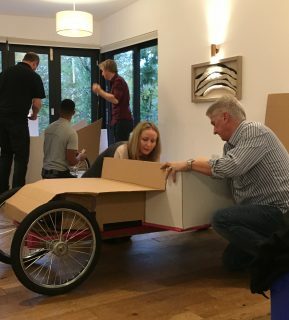 Luckily our questions were answered when we were taking into the team building room, where everyone was given a wooden base and wheels so our cars would make it off the starting line! Split into teams of 6-8, we were set our challenge and we began to get competitive.. 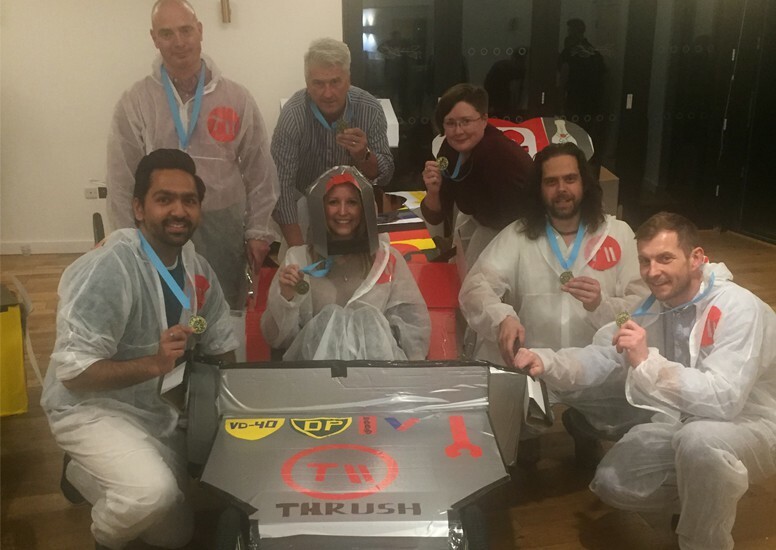 Create team names and branding, as well as some fictional sponsors with their own logos which had to be displayed on the car as well. Design the provided overalls with the above branding and get extra points if you devise some team caps! Present information back to the group on your chosen design and why you did it. Race the car into a pit-stop box, remove the wheels, turn it 180 degrees, place the wheels back on and race back to the finish line. Not forgetting to let the driver in and out! Over two hours seemed like a long time for the task but once we got started, it felt like we had no time at all and the competition heated up. Finally, after an independent adjudicator tallied up the scores, the winning team was revealed..